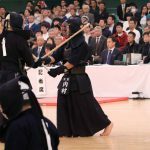 The last Gyokuryuki High School Kendo Championship (men’s edition) of the 20th Century was won by the underdog of all underdogs, Kurashiki High School (Okayama). 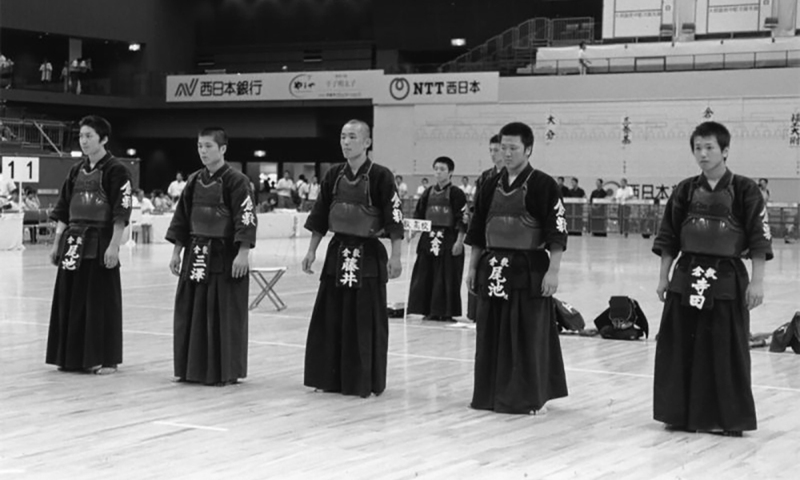 Kurashiki had only made it to the inter-high team championship once before. 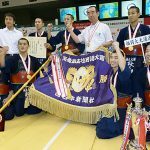 This year they won the Chugoku regional championship but lost in the prefectural preliminaries of the inter-high. Their best efforts at the Gyokuryuki games was the last 32. 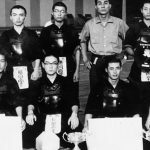 Previously, PL Gakuen from Osaka was the only team outside of Kyushu to win the Gyokuryuki (3 times), and many strong teams, even teams that had won the inter-high, had tried to reach the top but succumbed to Kyushu teams. No one, including themselves, would have predicted that Kurashiki would reach the top. The leading figure in this victory was Tomoyuki Oike, the Kurashiki taisho. In the 5th round against Sendai Ikuei (Miyagi), Oike defeated 4 in a row, starting with the opponent jiho, claiming a comeback victory. In the 4th round against Kumamoto Nishi he had also recorded 3 wins in a row. The only games that he did not appear in were the first round and the final. He kept appearing at key moments, and recorded a total of 12 victories. As with previous years, the teams outside of Kyushu crashed out as the tournament progressed. 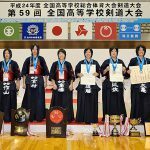 This year’s inter-high saw Kanto teams dominate the top ranks, but winners Takanawa (Tokyo) and Runners-up Toin Gakuen (Kanagawa) crashed out early, and the only non-Kyushu teams in the last 16 were Kurashiki and Takaoka Kogei (Toyama) who had come 3rd in the inter-high. Kurashiki were alone in the last 8. Kurashiki went on to beat Fukuoka Kodaifu in the quarter-final, and Oita in the semi-final. Both ended with Oike winning the taisho matches at the end. In final against Fukuoka Daiichi, a local team seeking their first win, an unlikely hero was born. Oike encouraged fukusho Ayao Misawa as he stood up to face the opponent taisho. 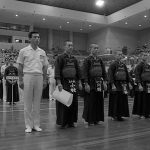 The taisho for Fukuoka Daiichi was Kazuaki Isogai, who had claimed two 3-in-a-rows against Yatsushiro Higashi (Kumamoto) in the 6th round and Ryukoku (Saga) in the quarter-finals, and a 2-in-a-row against Fukudai Ohori in the semis. He was one of the best taishos at the tournament, creating comeback after comeback. Misawa, on the other hand, had not won a match all tournament. But hearing the encouragement from Oike, Misawa went on the offensive from the get go. He attacked the men and claimed a kote ippon, Isogai showed his true strength by returning a degote, but in extra time Misawa seized a momentary lapse to claim a hiki-gote. At this moment, Kurashiki had become champions. 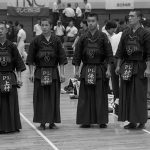 Kurashiki made headlines all over the country as an unseeded team beat 5 seeded teams to win, and it is fondly remembered in the history of the tournament.